I have no idea why, but these days I have a sudden craving for pancakes and frankly speaking, those pancake mixes are a total rip-off, and with 2 new bags of 1kg protein powder sitting in my kitchen cabinet, so why not make myself some protein pancakes? So let's get over with the ingredients so we can get started! First, mix all your dry ingredients and wet ingredients (except for cheese) in a large mixing bowl until JUST combined. If you wish to have extremely cheesy pancakes, you may fold in few handful of shredded cheese into the batter, but I'll prefer to have mine the grilled cheese sandwich style, so I didn't. So on a lightly greased pan, drop half of the batter in and move your pan around slightly to get the batter to spread into a nice and even circle. Cook on one side until you see bubbles appearing on the uncooked surface and remove it from the pan first (be careful not to "mess up" the uncooked surface) and proceed with cooking your 2nd pancake. For the 2nd pancake, flip it once you see bubbles appearing on the surface, and then place in your cheese (as much or as little as you like) and lay the 1st pancake over the top, cooked side down onto the cheese. Cover the pan with a lid and let it cook for another 2 minutes on low. Then, flip the pancake-sandwich around and cook on the other side for another 2 minutes, pressing down on the pancakes it cooks, or until you see the melted cheese oozing out from the sides. Plate your pancakes and top it up with some ham or bacon! 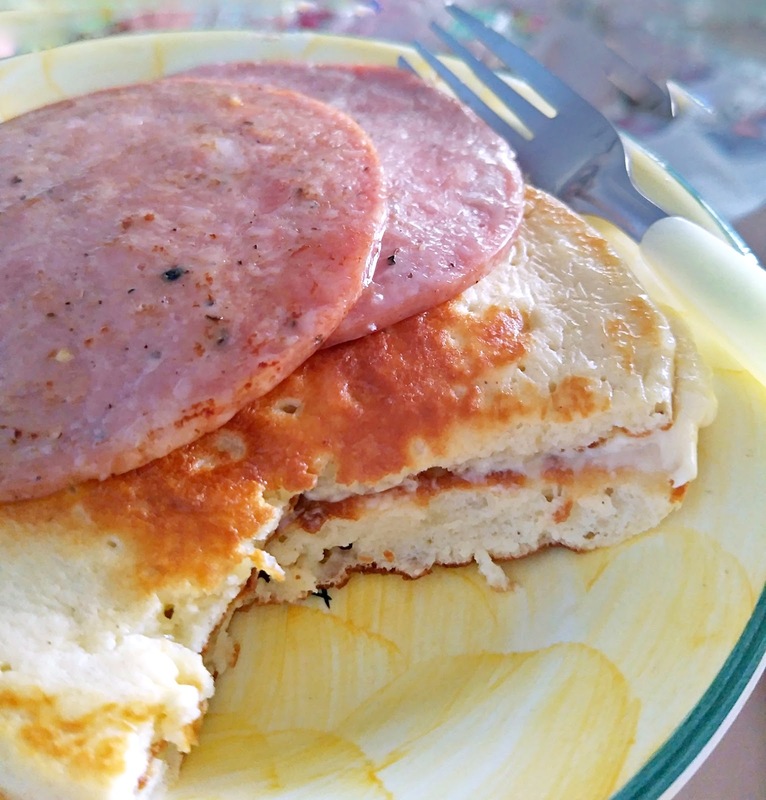 Other for the ham (processed meat), this protein pancake is actually pretty healthy and calorie-friendly. A serving of two pancakes (without cheese) will only set you back by 272 kcals and giving you 33g of protein! Adding the cheese (1 slice cheddar and about 10g of shredded mozzarella) will push the calories up to 333 kcals, but with almost 40g of protein! For all you pancake lovers out there trying to increase your protein intake, this will be a super simple, quick and easy recipe for you! Do try this out and let me know how it turned out for you.